What to Eat at Smorgasburg, Round 5 | Wanna Fork Around? Every week, Brooklyn is flooded with 5000+ people a day, as they meander the aisles of food tents known as Smorgasburg in Williamsburg and Brooklyn Heights. From 11-6 on Saturdays and Sundays, you can choose from anywhere from 75-100 vendors that offer specialty honeys, teriaki balls, pizza, and everything else in between. I’m a veteran of Smorgasburg, and while some vendors are mainstays of the food market, there are new ones every year to choose from. So how does one pick from the incredible options? Do you go with well established restaurants and food trucks like Red Hook Lobster, Dough, and Mighty Quinn’s, or do you try lesser-known gambles like Outer Borough, Sunday Gravy or Bolivian Llama Party? I don’t have all the answers, but I am here to help. Throughout the season, I will be sacrificing myself for you, our readers, and giving you my reviews of various Smorgasburg vendors, one weekend at a time. Guys – it’s the end of an era! 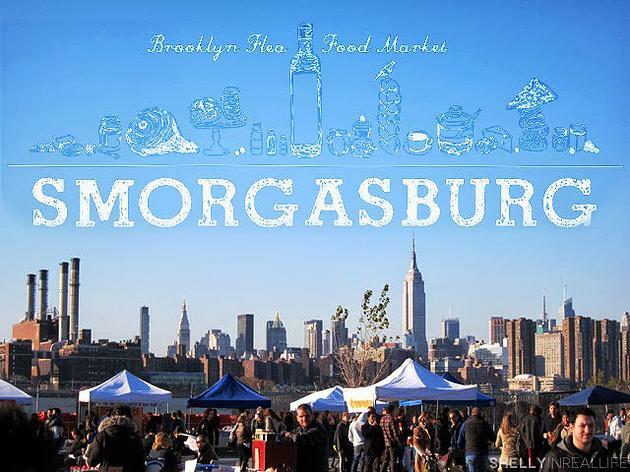 This weekend marked the last that Smorgasburg is in Brooklyn Bridge Park, before their big move to Prospect Park in Park Slope starting Aug 30th. 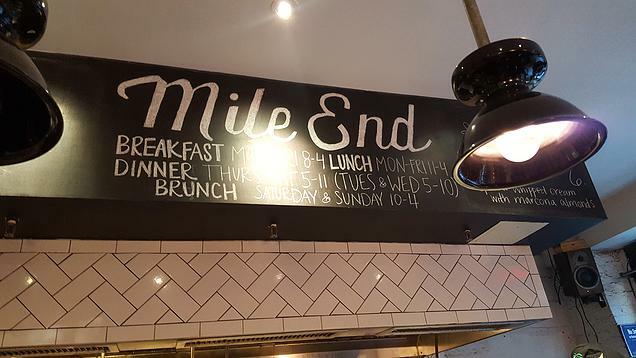 Brooklyn Heights sheds a tear and pours some out for their foodie homies. As I brace myself for a trek on the F train every weekend instead of my leisurely walk down Atlantic Ave, I bring you my latest installment of what the heck to eat there. What better food to send off my sweet weekend food fest with than french fries? It’s the staple of my diet and dammit, Home Frite does it right. This 2 year old company has perfected the hand-cut french fry and the dipping sauces that go with it. Home Frite uses all natural ingredients, starting with Russet potatoes, canola oil, and from-scratch dipping sauces using a wide variety of season ingredients. I went with Poblano Fraiche, mainly because I’m on a poblano pepper kick lately and can’t seem to get enough of the flavor! I can tell you from experience that the Curry Ketchup and Chipotle Ranch sauces are also to die for. Home Frite is super social, and they encourage you to engage with them on Twitter, Instagram, etc. 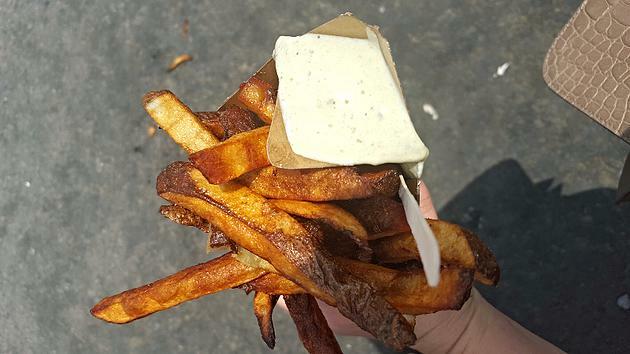 using #FryDayEveryday and their @homefrite handle. This is the perfect activity to take part in while standing in the ridiculously long line that is before you at any Home Frite stand at any festival or food event they are present at. These fries are so crispy and satisfying, and in my humble foodie opinion, a step above Pomme Frites. You won’t be disappointed!